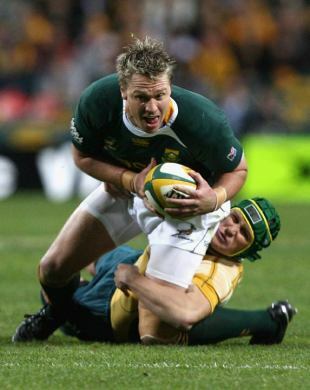 Jean de Villiers is determined to leave South African rugby on a high as he prepares to join Magners League champions Munster. The 28-year-old centre will start against Australia in Brisbane on Saturday as the Springboks look to wrap up their third Tri-Nations title, and first since 2004. De Villiers' move to Limerick will rule him out of Springbok selection for the foreseeable future and this fact has heightened his desire to leave with silverware in the trophy cabinet. "For me, going away after the Tri-Nations and ending the tournament on a high would be a great thing," he said. "This team is fantastic, awesome guys and it's been great to be a part of it. It means so much more when you pull on the jersey and it flashes in the back of your mind that your last game for the Springboks is close. "It's made me change my approach and I'm just enjoying playing a lot. Last week (in a 32-25 win over Australia) was definitely my best performance of the year. It will be my last time in Australia, hopefully not for always, and the big thing is to reproduce last week's form again this week. I haven't scored a try for a long time." De Villiers will line up alongside Jaque Fourie, winning his 50th cap, in Brisbane and is hopeful that his form for Munster will keep him in the thoughts of Springbok coach Peter De Villiers should he decide to return to South Africa. The Rugby World Cup in 2011 is clearly in the back of his mind, when the Springboks will defend their crown in New Zealand. "The coach has got a policy of not selecting overseas players and rightly so. So I will need to keep strong, try and play good rugby and get selected hopefully in the future," he said. "I have a one-year deal with an option to sign for two more years, which we'll look at in February/March. "The 2011 World Cup is obviously a factor. But it's still a long way off and I don't like to make decisions too far in the future because you never know what the future holds. All I can do is play my best and hope. But being with a team that is playing so well, that is so happy, it's great just to be a part of it and I will definitely miss it."